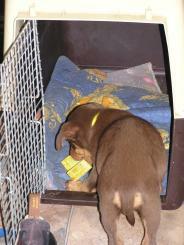 Crate training is a great aid with puppies. We consider it almost essential. 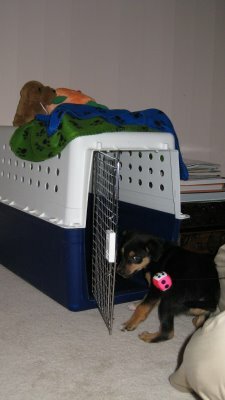 The crate teaches puppies (and adults) restraint. This is so important if you want to have a well behaved dog. 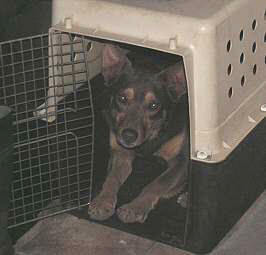 Crate training, down-stay lesson and the tie-up exercise are all restraint lessons. If you can manage all three you will do very well but having at least one is essential. It gives them their own place, a little den of their own, a place to be calm and relaxed. It helps with toilet training, it helps with control training and it helps with the foundation training that will lead to other, more advanced lessons later on. Without this training you are likely to have a lot of barking, howling and anxiety at night. 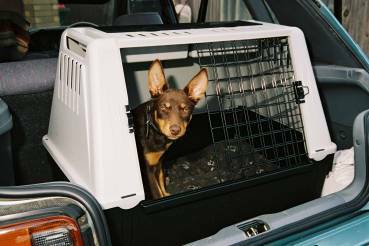 Dog owners that have not had their dogs crate trained often tell me that they spent the first two weeks with many sleepless nights. 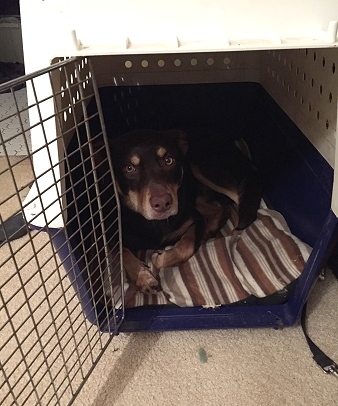 Most dog owners who bought puppies without the option of having crate training, usually have the puppy running free in a laundry or garage at night and the poor little puppy is very upset and scared. The puppy's anxiety goes through the roof and it is really not a good start to their time with new owners. The owners get no sleep so their nerves are frayed too. 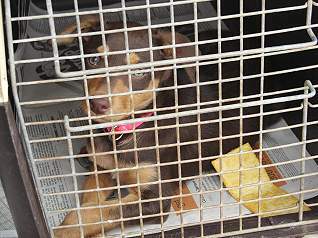 Puppies crated without any training are usually just as bad. It is not uncommon for them to panic, urinate, or even vomit. They will certainly howl and bark for hours. We recommend you get a reasonable sized crate, even for a 8 week old puppy. They grow at a rapid rate. If you don't already have one, we usually have supplies of new crates, 55 cm high at $95 each. (2015 prices). Smaller puppy crates available for $75. We have to pay retail prices but we buy them by the carton and get a small discount so this is usually a few dollars cheaper than most pet stores sell them for. We have a crate training package for just $50 for new puppies going to their owners where we begin all the crate lessons and make it easy for you. This training takes between 5 and 7 days. 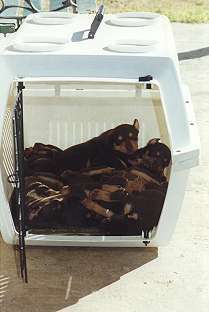 We start these lessons by putting a group of puppies into a large crate together and monitor their response. We then break it down to two puppies for about 20 minutes and then longer periods, then puppy on own and so on .... We vary this over a number of sessions over days until finally the puppy can sleep overnight in a crate all by themselves without a problem. This is very worthwhile having done. It doesn't make your puppy 100% perfect. That takes time. But it does make things much, much easier and the pup doesn't panic, howl continuously or soil itself which is common with non-trained puppies. On the first night in a new home expect a bit of whimpering for a few minutes (instead of hours) and even that should stop the second night or within a few days. 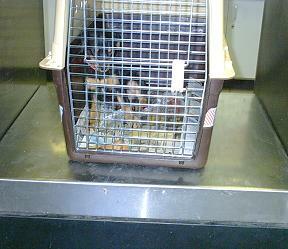 This crate training package is optional for most customers but is not optional if the puppy is being transported by plane. 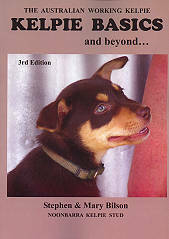 We automatically add the basic puppy training package to ALL travel costs by plane. 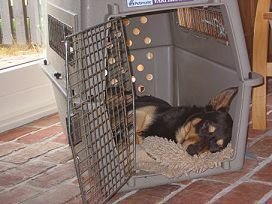 We do not want pups stressed or upset and we refuse to send them long distances without proper crate training beforehand. We want them to arrive happy and relaxed. This fee will be automatically added to air freight costs. The more comprehensive puppy training package, which includes the crate training has more handling and socialising involved. As well as having the puppy learn to travel in a crate (which can be a different experience) it adds a number of other puppy training which may include various things such as teaching a pup to tie up without panicking, sitting, lying down, interacting with adult dogs, going into town and socialising, maybe being with us at a cafe, beginning the down-stay lessons, learning good manners, exposure to noise, teaching calmness, travelling in a car and (if they are ready) maybe some very, very basic walking on a lead. This package is the $100 Basic Puppy Training package. It starts your puppy off on foundation training and sets everything up to make it easier on customers. Once again, we need to emphasis that it doesn't make your puppy fully trained. That is impossible at that age. Even walking on a lead is a huge undertaking at 8 or 9 weeks. Puppies get distracted very easily. This training package gets you started in the right direction and the puppy understands what is required. "Thank you so much for your hospitality on Saturday when we picked up Boris. We just wanted to let you know how he is going." "He was pretty playful in the car on the way home, but after chewing on the schmacko (chew treat) he was tired and slept on my lap for the rest of the journey home, with a few toilet stops in between." 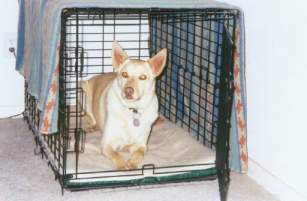 "That night we put him in the crate (brilliant invention) and he was so quiet after 5 minutes of whimpering that I had to check if he was still breathing!" 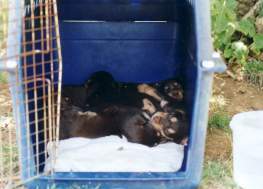 Often we find our own Kelpies like to go into crates and they sometimes find an empty crate we are using for puppies to lie in. 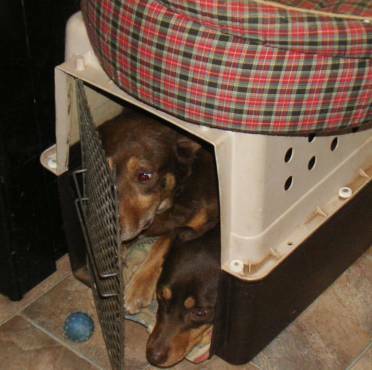 Here two of our adult dogs have crammed themselves into one small crate. 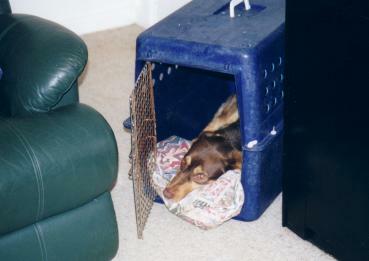 I can't imagine it would be too comfortable but it demonstrates how much they come to love their crate. Noonbarra Dusty in a crate. 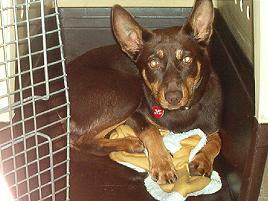 Adult Kelpies like Noonbarra Dusty and Noonbarra Flash often crawl into a crate because they like them. 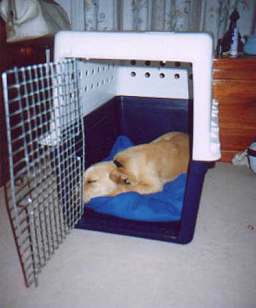 Most of the puppy crates are really too small for them but that doesn't stop them. The crate training you did with him worked wonders and he happily trots into his crate whenever I go to bed, and in the morning is happy to stay there until I decide to wake. James Boyle and Noonbarra Scamp. ... She is a real honey loves the beach more than ever as she grows and loves her new bedroom it's so much bigger than her all crate which we just use in the wagon now. Thank you so much Mary for talking me into a crate which as you may remember I wasn't keen on in the beginning and now we have up graded to a bigger one. Noonbarra Rocky arriving at airport to be picked up by his new owners. 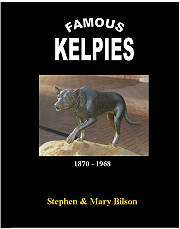 Note: 2015 This customer has now ordered a second Noonbarra Kelpie. The crate training you did with him worked wonders and he happily trots into his crate whenever I go to bed, and in the morning is happy to stay there until I decide to wake. Noonbarra Dave even as a fully grown adult loves a crate and will often just go in and have a sleep. 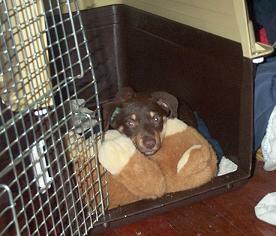 The very first day back in 2008, when I brought her home she was a model puppy, slept all night and every night from then on without moving out of her soft crate or basket. You must have conditioned her well with crate training. This allows them to get used to having a crate as a den and teaching them to go outside to the toilet. Just wanted to let you know that Bonnie has settled in very well. Don't hear a peep out of her at night time (thank you for the crate training). Bonnie has taken a real shine to my autistic son Jacob. I think she knows that he is special. I can see a very strong bond developing between the 2 of them. Bonnie had her second vaccination this morning. Wanted you to know the vet was very impressed with Bonnie and couldn't believe how calm she was. Vet was very impressed with Bonnie's health and temperament. Thank you for providing such a wonderful puppy for my family, she doesn't jump up and is very relaxed even at the vet. There are many different types of crates on the market.